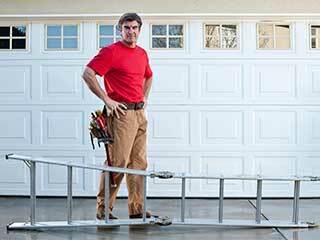 Without proper maintenance, your garage door may, in time, be in need of expensive repairs or even replacement. This type of maintenance should be on your to-do list at least once a year. After all, you need to keep your door in the best shape possible for the security of your car and your family. Professional help is often required when it comes to this sort of maintenance for extra peace of mind. With regular safety checks performed by our knowledgeable and friendly team, you can prevent your door from abruptly malfunctioning, and minimize the chance that you’ll have to shell out cash for expensive repairs. From checking the spring torsion to visual inspections to make sure everything is in tip-top condition, you can trust us as your local garage door maintenance team. Because springs are the garage door parts that are bound to require regular maintenance and adjustment, you'll want to be sure they are functioning properly. Even though it is possible to test and adjust the springs yourself, it is always a good idea to get professional help, because this way, you can rest assured that everything is checked according to the highest standards. With regular, correct lubrication, your garage door will work smoothly all the time. All moving parts of the door require a bit of attention when it comes to lubrication, and it's best to do so every six months. Our friendly team will make sure the mechanisms are lubricated properly while also checking for any tracks filled with debris and more. Call our knowledgeable team today for all your garage door maintenance needs and we'll be there to make sure everything is working as it should be!